Save-On-Foods will be an anchor retailer in the massive University District mixed-use development in Calgary and the grocery store will be part of a building with close to 300 residential units above it. The 38,000-square-foot grocery store will break ground at the end of this year and is anticipated to open in 2020. James Robertson, president and CEO of West Campus Development Trust which is spearheading the major residential, commercial, retail and office project on University of Calgary land, says the grocery store is an important anchor for the project. “Whenever you’re establishing a community, a grocery store is kind of a central component of day-to-day life. It not only allows residents to maintain their lifestyle within the community without having to leave, it also allows us to kickoff our retail or to start up our retail component of this community in a substantive way,” says Robertson. “And so if you can imagine you have a grocery store, a coffee shop, a bank, a wine store, you have all the basics of everyday life. It was very important for us to do that as close to the beginning of the development of this community as possible. University District, which is on 200 acres of land, will cost an estimated $25 billion to $35 billion to build for the entire project. When full build-out is complete, in 15 to 20 years, the community will have 15,000 to 17,000 people living and working there. Located at 32nd Avenue N.W. and Shaganappi Trail, the project will include 40 acres of open space, 8.7 million square feet of buildable area, 250,000 square feet of ground floor retail along nine blocks, 1.5 million square feet of office space, and 6,000 to 6,500 residential units. "Calgary is enjoying a surge of high density urban mixed-use development projects that are at the leading edge of the Canadian real estate industry,” says Michael Kehoe, an Alberta-based retail specialist in Calgary with Fairfield Commercial Real Estate. “Currie Barracks, East Village and the University District are prime examples. “Often these projects are transit-oriented and feature a combination of residential, retail and office uses. The cornerstone of these projects are the grocery anchor stores tailored for the urban professional consumer that will become focal points for the neighbourhoods. In a high-density mixed-use project, the grocery anchor will provide a multitude of non-retail services and often occupy multiple levels with office and residential above. The major grocery chains have created branded urban concepts that can adapt to a variety of footprints and micro-markets." Save-On-Foods is opening its eighth Calgary area store October 6 with its second store in Airdrie. Company president Darrell Jones says the University District is going to be a “fantastic place” to be for the grocery store. “It’s an ability for young people to understand our brand which is a modern brand. The store will have everything that young people and families want. Sushi. Wing bar. Hot meals. Hot soup. Starbucks coffee. All the things for modern families that are in a hurry,” says Jones. “E-commerce. They’ll be able to click and collect or have it delivered to their home today." 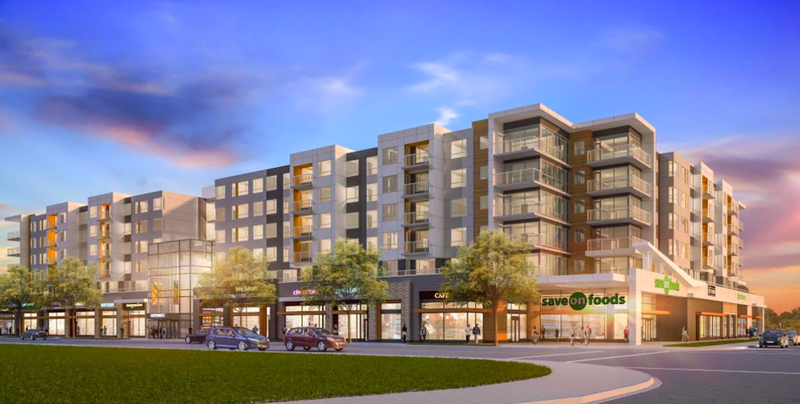 Above the grocery store, the mixed-use rental building, built by Gracorp Capital Advisors Ltd. (Gracorp), will feature 288 units of residential space. The units are anticipated to be one-to-three-bedroom floor plans that range in size from 528 square feet up to 1,130 square feet. Jones says there is a trend to build residential above retail space because real estate is becoming more expensive and there is a need to maximize what can be developed on land. It is also a concept that is convenient for residents who have amenities right in their building. West Campus Development Trust says nine additional retailers will be part of the grocery store block, and have been carefully chosen to meet a host of community needs and interests — from neighbourhood coffee shop and specialty restaurant, to pet store and wine merchant. In the coming months, the trust will be announcing some of those retailers, and the newest hotel resident and builder, located across the street from the grocery store. Kwangyul Choi, a postdoctoral research fellow under the Richard Parker Professorship, jointly appointed in Haskayne School of Business and Faculty of Environment Design at the University of Calgary, says having a grocery store as an anchor in a neighbourhood is a good idea for residents in giving them a number of opportunities for social interaction. Albert Tonghoon Han, Postdoctoral Research Fellow to the Richard Parker Professorship in Metropolitan Growth and Change, jointly appointed in the Haskayne School of Business and Faculty of Environmental Design at the University of Calgary, says mixed-use developments balance the mix of commercial and residential use to take advantage of providing more amenities closer to where people live.